By Scott Gilfoid: Promoter David Higgins says Dillian Whyte is going to be in for a shock this Saturday night when he gets inside the ring with Joseph Parker, who he believes is going to knock him out in their fight on Sky Box Office at the O2 Arena in London, England. Higgins expects Whyte to come forward and look to slug with the 26-year-old Parker, but that ultimately will be his undoing. Parker is in great shape according to Higgins, and ready to take his power game to run over Whyte in front of his own boxing fans at the O2. It’s a smart move on Parker’s part to be looking for a knockout because he’s fighting in the UK in Whyte’s venue, and the chances of him winning a decision are remote at best. If the fight goes to the scorecards, it’s likely going to go Whyte’s way. Parker found out the hard way in his last fight against Anthony Joshua how hard it is to win a fight as the visiting fighter in the UK in losing an ugly 12 round decision in Cardiff, Wales. For 12 rounds, Parker was stuck fighting on the outside due to the referee pulling him off of Joshua each time he attempted to fight him on the inside. It was one of the oddest fights I’ve ever seen before, and left a bad taste in the mouth of boxing fans who couldn’t understand why the referee prevented inside fighting. I think it’s fairly obvious that Whyte is going to try and slug it out with Parker, because he’s a hot-headed type of fighter who can’t resist a dust up even if it doesn’t favor him to do so. I’m sure that Whyte’s trainer has told him to keep a level head and fight smart against the younger, more powerful Parker, but he’s not going to follow his instructions. As soon as Parker lands his first big right hand, Whyte is going to likely lose his senses completely and start throwing power shots. Parker will then have Whyte eating out of his hand at that point. This could be an easier fight for Parker than his mismatches against Hughie Fury and Razvan Cojanu. Those two fighters stuck to their game plans for the full 12 rounds against Parker in losing efforts. I mean, the game plans were utterly stupid, but at least they saved those two fighters from being knocked out. Whyte on the other hand isn’t going to follow the game plan unless it’s one that consists of him bum rushing Parker for the entire fight. Whyte can follow that type of game plan, but he definitely can’t follow a game plan that requires for him to use his boxing skills for a full 12 rounds in my view. Whyte is too much of a hot head for him to fight smart, and that ultimately will be his undoing because he’s going to be going straight into the teeth of Parker’s superior offensive machine. When you have an aging slapper like Whyte going straight at a younger fighter with the power that Parker possesses, it’s not going to be pretty. Whyte was almost knocked out last October by Robert Helenius after marching into a right hand in round 2. Fortunately for Whyte, he was clipped at by a right hand at the end of the second round rather than earlier in the round, because he would have been finished off for sure by the 6’6” stork-like Helenius. Whyte has been talking a lot of trash about Parker, questioning his courage from his last fight against Anthony Joshua on March 31. Parker has an opportunity to shut Whyte’s trap when he gets him inside the ring, but he must make sure that he knocks him out unfortunately. As I mentioned previously, if the fight goes to the scorecards, it likely will go against Parker. He must knock Whyte out to make sure he takes the judges and the referee out of the equation because he’s the visiting fighter and you just never know what you’re going to get. Parker’s sparring partner Malik Scott was quite impressed with his hand speed in preparation for the Whyte fight. Malik believes that Parker has the best hand speed that he’s faced. “Malik said ‘Yes, he’s the quickest heavyweight in the division’. By far the quickest hand speed he has ever come across,” Higgins said. 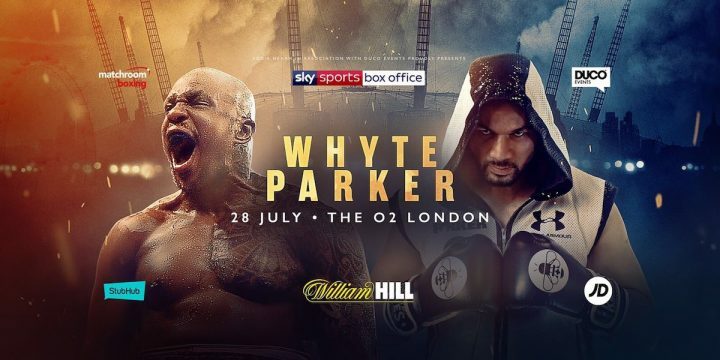 Parker’s hand speed, punching power and youth advantage over Whyte is going to give him a huge boost to score the knockout that he’ll be looking for. It’s obviously a positive that Parker knows that he’ll need a knockout in this fight, because if he came into the Whyte fight with the illusion that he could win a decision, he might waste time boxing and end up losing a decision. Parker knows what he has to do to get the ‘W’ on Saturday night at the O2 Arena, so it’s now about him just carrying out his trainer’s game plan to the letter to get the stoppage win.